Introducing ‘appreciative Friday’ at one NHS trust has helped staff, family and carers of people with dementia feel valued. 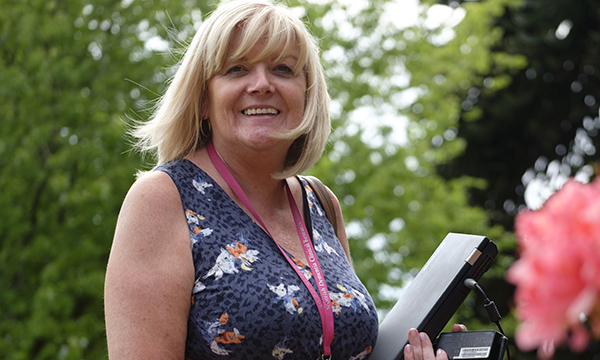 Queen’s Nurse Lorraine Haining, last year’s winner of the RCNi Nursing Older People award, decided to post a weekly message on social media to thank her staff and family carers for their support for people with dementia. Until recently, Ms Haining ran the multidisciplinary Interventions for Dementia, Education, Assessment and Support (IDEAS) team at NHS Dumfries and Galloway. The IDEAS team helps people to manage stress and distress in dementia and delivers a training programme for care home staff, carers, district nurses, social workers and others, as well as running a clinical caseload. ‘Every week, on the IDEAS Facebook page, I would send a message thanking staff and families for caring,' Ms Haining told nurses at the Queen’s Nursing Institute Scotland annual conference on 3 April. Ms Haining, now an independent dementia nurse consultant, said the posts included positive affirmations, advice and favourite quotes and pictures. ‘Sometimes we would invite a guest “presenter” and people started sending me things to put on the page,’ she said. Ms Haining said the Appreciative Friday project sparked an idea to ask staff and families to help create a giant knitted ‘love’ blanket to represent the fact that people with dementia, their carers and staff need to be comforted and nurtured. She added that using social media had been a really successful way to support staff. The IDEAS facebook page attracted more than 600 followers during the course of the love blanket appeal.